I LOVE aubergine. It’s my favourite vegetable (which for me is a big deal as I also LOVE vegetables very much and try not to discriminate between them) and whenever I’m out at a restaurant, if there’s aubergine to be had I’m all over it. Trips to visit my cousins in Israel are basically just massive aubergine fests, as they do the most incredible dishes with tahini and pine nuts and they’re basically just heaven on a plate. I created my Israeli-inspired roasted aubergine recipe after one such visit but don’t get me wrong, my favourite vegetable has a lot more to offer, so I felt the need to share with you another of my fave ways of eating it.I used to be a bit scared of cooking aubergine myself, as it always seemed to taste a bit weird and be a bit dry whenever I attempted it, but I’ve learnt that the secret is 1) olive oil , 2) salt and 3) cooking it slowly. Stick with that combo and you’ll end up with the juiciest, most tender aubergines that melt in your mouth and just taste incredible. This recipe is just fab as it’s got all the deliciousness of a pizza, but you don’t have to spend ages making a base. It’s also a much healthier and lighter version and is great as a starter or as a main meal. The aubergine flavours work so well with the tomatoes and the ‘cheese’ and like any pizza you can go wild on the toppings and pile whatever you like on top – the more the better! 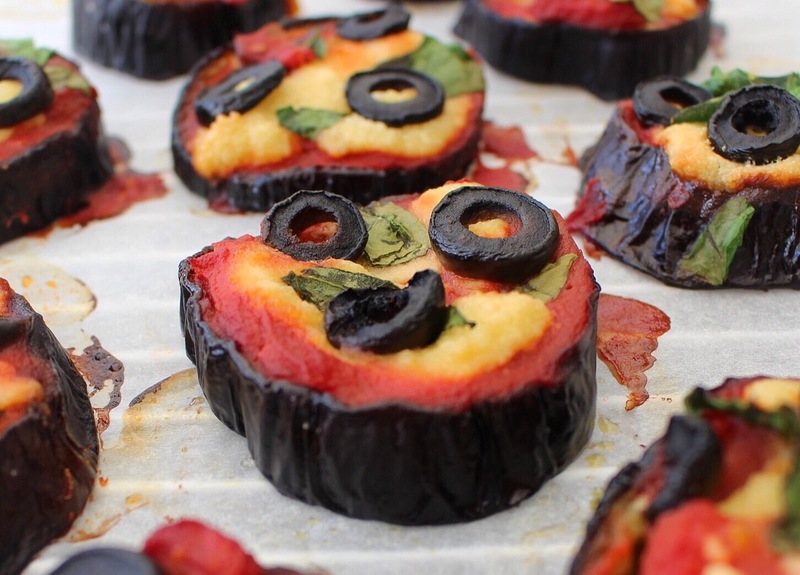 Preheat the oven to 180C and cut the aubergine into slices about 1cm thick. Sprinkle the salt on each side of the aubergine slices and place them on a piece of kitchen roll for about 15 minutes to get rid of some of their water. Pop them on a lined baking tray and drizzle the olive oil over them, making sure they are nicely coated. Bake for about 20 minutes, then remove them from the oven and to each one add a tbsp of chopped tomatoes, a tbsp of almond cheese, a basil leaf or two, some olives and whatever other toppings you fancy, then place them back in the oven for another 10 minutes, until the toppings are cooked. 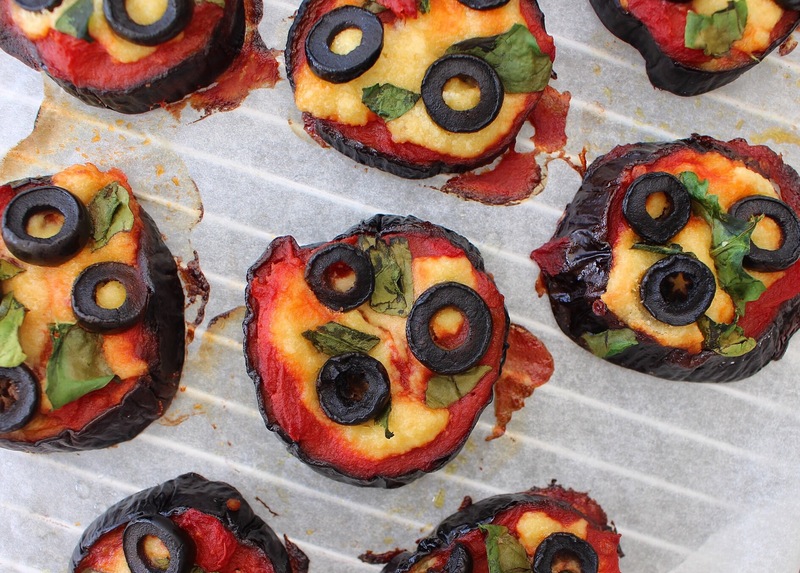 And there you have it – super easy and healthy aubergine pizzas!